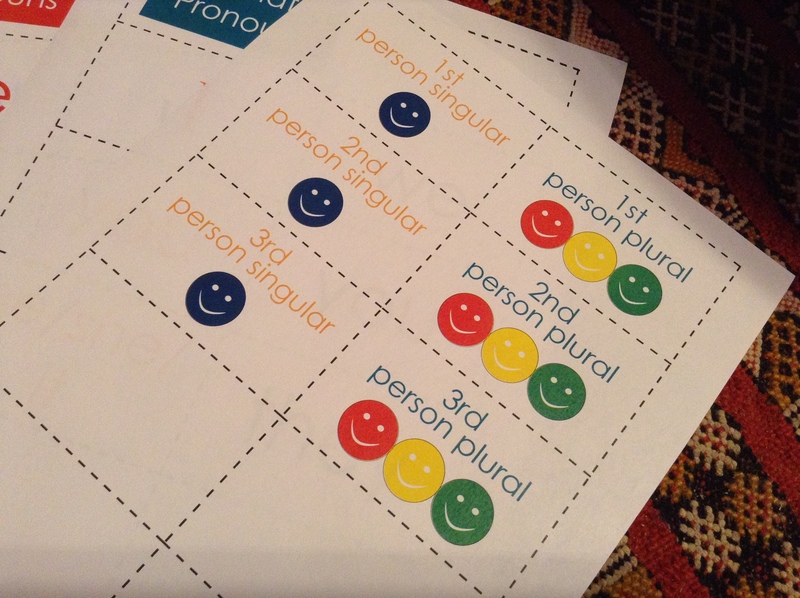 Then, I added the cards from the packet to the 1st column, showing the order of the pronouns. 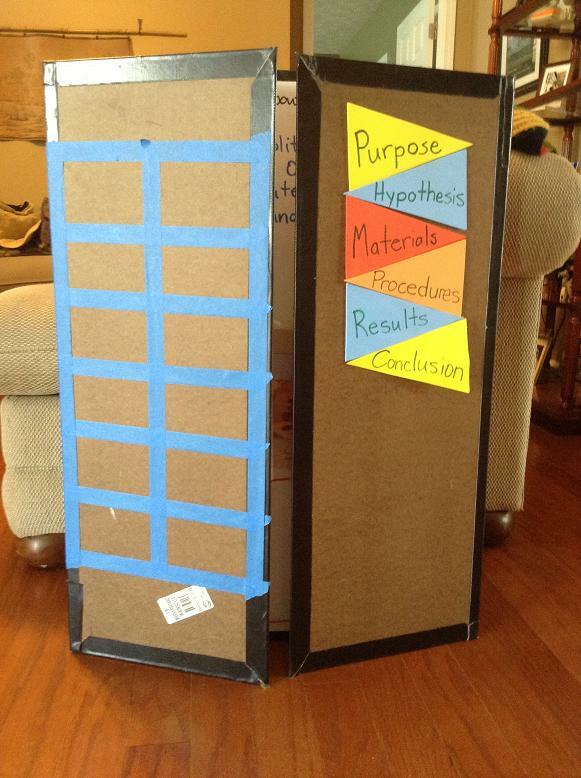 In the subsequent weeks, I will use the second column to include the pronoun cards. This was a glorious tool in my Abecedarians class this past week! I used the song “C2 W3 Pronoun Order.mp3” uploaded by: loriberlie from CC Connected to teach the kiddos. We sang through the song a few times. I ended our time by pulling the cards off the board and turned them face down on the ground. Each child had to pick one card and put it into the correct spot on the grid. They did it PERFECTLY the first time! Wahoo! Also, I used this at home today with my boys. They just couldn’t remember the order of the pronouns. So, I taught them the song, pointed to the cards as we sang, and then played the same “game” I used in class with my Abecedarians. By golly, the order finally “clicked” for them too. 🙂 🙂 Happy sons, happy Momma! I hope this will be helpful to your family or your class! Even if you don’t do Classical Conversations, you could easily use this at home to help your children master pronouns! Enjoy! SO GLAD to hear that this is helpful! God bless! YEAH!! I was just talking to our other tutors about how we will help the kids keep all the pronoun lists apart from each other in their brains. This will be a tool I use! Thank you for sharing this with us. YAY, Tricia! 🙂 so glad to hear that this will be helpful to your community! 🙂 Praying that you guys have a wonderful year! 🙂 How’s your son doing, by the way? 🙂 God bless! Thanks for sharing your ideas! It is a big help to me. I’m glad to share! 🙂 THankful to hear that this is helpful for your family! Have a great year! 🙂 God bless! Thank you, Suzanne. This visual will help my auditory learner, too! This looks great, Suzanne! I do the same thing in church…definitely a visual learner and I have to take notes! : ) Thanks! I hope they’re helpful!!! 🙂 Hope you’re having a great school year! Hi Suzanne, I grabbed these off CC connected, as well as the History sentence copy work pages, which I loved before I even knew they were yours! I’m working on a kind of round up of all the CC connected stuff I’ve used for the first 6 weeks (better late than never!). Can I use the photo of your pronoun packet all fanned out on my post? Sure, girl! 🙂 If you can just put a link to the post with it, that would be great. Thanks for thinking of me! I’m glad to know that you guys have enjoyed them. 🙂 🙂 Hope that you guys are well! Thanks Suzanne. The post is up on my blog, if you’re curious. Thanks so much for sharing your work! awesome, girl!!! thanks so much! i looked at it this afternoon! it looks awesome!!! Hi Suzanne, these are great! Are you planning on making more for the rest of the pronouns? Thanks! Look what I just made. 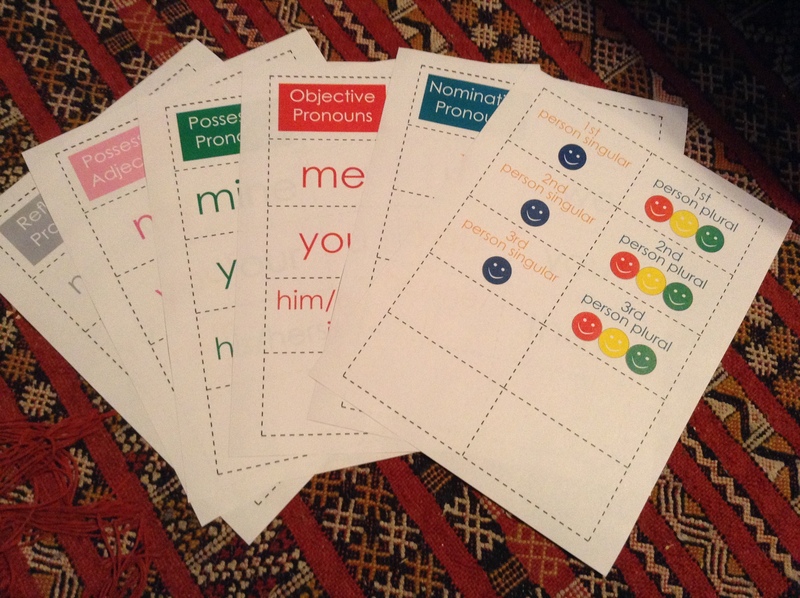 🙂 🙂 🙂 http://suzanneshares.com/2013/10/20/demonstrative-interrogative-pronouns-free-printable/ Enjoy!!! Oh, yay! Thanks so much! I love these! I printed and laminated them and have used them when I sub-tutor and with my own kiddos. I found one mistake: Possessive Pronouns, 2nd Person Singular should be “yours” not “your”. Thank you so much for this printable! !